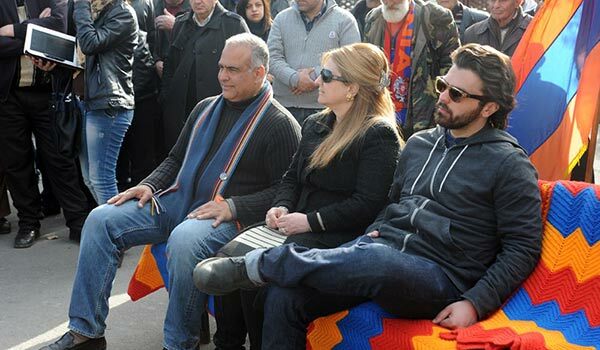 Authorities have denied opposition leader Raffi Hovannisian’s request to put up a tent in Liberty Square, where Hovannisian is on a hunger strike in protest of the February 18 presidential election outcome in which he finished second in the official ballot. Hovannisian, founder of the Heritage party, started his strike Sunday, and has vowed to go without food until April 9 – inauguration day – unless President Serzh Sargsyan concedes to Hovannisian’s claim that he is the rightful winner. Heritage party vice-president Armen Martirosyan told ArmeniaNow that the second night of the hunger strike was peaceful despite the rainy weather at night in the capital. Martirosyan submitted two petitions to the city hall asking for permission to put out a tent and an umbrella in Liberty Square, but the tent was refused. “By some government decree the area adjacent to the Opera House has been recognized as cultural-historical heritage, and accordingly the asphalt at Liberty Square is historical-cultural heritage too. On that basis it is forbidden to put out a tent on it,” says Martirosyan, adding that although the city hall licensed the installation of an umbrella, now the police won’t let it. “The police have some measurement criteria on what’s considered to be rain, and what’s not. I guess they view it as rain, when, as people say, water is pouring from the sky like from buckets, and in all other cases it’s not rain, hence the drops don’t make anyone wet,” says Martirosyan. Armenia’s first foreign minister, 53-year-old Hovannisian had similar issues two years ago during his other hunger strike when the police didn’t allow him to put out a tent. Hovannisian’s supporters installed one, but the police removed it. On Tuesday the opposition leader set limitations to his communication with the media and said he would meet the press once a day at 5 p.m.